Ever wonder how (and where) Sierra tests its bullets? The answer is underground, in a 300-meter test tunnel located under Sierra’s factory in Sedalia, Missouri. The photo above shows the construction of the tunnel back in May, 1990. Like most bullet manufacturers, Sierra does live-fire bullet testing to ensure that Sierra projectiles perform as promised, with repeatable accuracy. 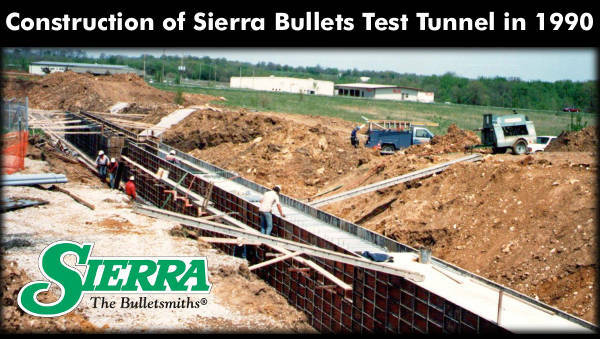 Sierra’s 300-meter test range is the longest, privately-owned underground bullet test facility in the world. Sierra offers free tours of the test tunnel as part of Sierra’s Factory Tour Program. Sierra Bullets uses dozens of barreled actions for testing bullets. These barreled actions are clamped in stout, return-to-battery test fixtures. These heavy test fixtures provide near-perfect repeatability (with no human-induced holding or aiming errors). Each barrel has its own logbook to track the barrel’s usage. Interestingly, Sierra does not have a specific round count for barrel life. When a barrel starts “opening up”, i.e. showing a decline in accuracy, then the barrel is replaced, whether it has 800 rounds through it or 5,000. What kind of 200-yard accuracy can you get in an enclosed, underground test range? Would you believe 0.162 MOA at 200 yards with a .338? Check out these 10-shot test groups shot at the Sierra Test Range at 200 yards. Note that the numbers listed on each sample are actual measurements in inches. To convert to MOA, cut those numbers in half (to be more precise, divide by 2.094, which is 1 MOA at 200 yards). For example, the 0.340″ middle group works out to 0.162 MOA at 200 yards. Share the post "A Look Inside Sierra’s 300m Underground Test Tunnel"
In this NSSF Video, Ryan Cleckner, a former Sniper Instructor for the 1st Ranger Battalion, explains how to gather and organize D.O.P.E. (Data On Previous Engagements) and how to organize this information to make it readily available in the field. As the term is used by Cleckner, D.O.P.E. includes observed bullet drop information at various distances, as well as the effects of wind, temperature changes, humidity and other environmental variables. If you know your muzzle velocity, and bullet BC, a modern Ballistics App should be able to calculate bullet drop with great precision at distances from 100-1000 yards — often within a couple 1/4-MOA clicks. However, because a bullet’s BC is actually dynamic (changing with speed), and because ballistics solvers can’t perfectly account for all variables, it’s useful to collect actual, verified bullet drop data. It’s smart to start with ballistics data from a solver app, but, as Cleckner explains: “Odds are, you’re going to have to fine-tune that data to your gun and your system. Every scope and every rifle and every bullet [type] act differently. Your scope may not track the same from rifle to rifle, so it’s important you get the data that’s unique to you.” Cleckner also explains that the ballistic data supplied with some factory ammo may only give you a crude approximation of how that ammo will actually shoot through your gun. Cleckner also offers some good advice on how to record D.O.P.E. on simple index cards, and how to keep your ballistics data with your rifle. This can be done with a laminated drop chart or data transferred to a scope cover (photo right). CLICK HERE, to learn more about creating handy field data cards. At the 4:15 mark on the video, Cleckner shows a calibrated tape he has fitted around the turret of his riflescope. The tape shows distance numbers (e.g. “4” for 400 yards, “5” for 500 yards etc.) that correspond with the number of clicks (rotation) required to be zeroed at that particular distance. With that system, you simply “dial your distance” and your point of impact should equal your point of aim. It takes some skill (and the right software) to create these tapes, but the concept is great. Share the post "Practical D.O.P.E. Video Offers Tips on Ballistics Data"